There are a lot of views looking down Radiator Springs in Cars Land at night, in the direction of the Courthouse. But I don't see as many views looking the other way, toward the entrance of the land, taken from the Courthouse. But it's a beautiful vista as well, and during Christmas time, the luminous decorations and hanging holiday wreathes make for a charming and tranquil view--especially at night, after everyone has left. 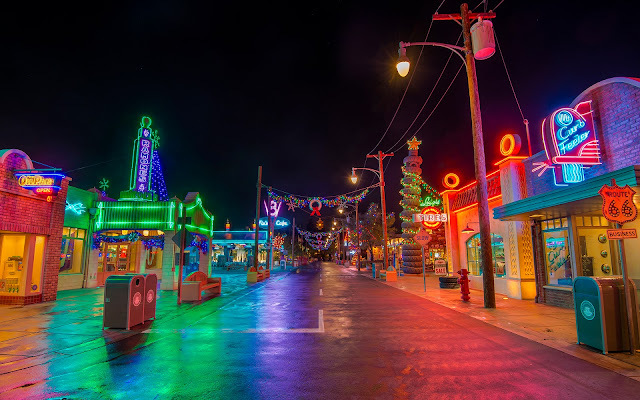 During this time of the year, Cars Land literally glows with the spirit of the season, and behind the visual puns and flashy eye candy, there's an authentic and touching charm to it all! Glistening neon and Christmas decorations light up Radiator Springs.